It is proud reality, comrades! We are working on our first feature-length film project. Want to learn more about SIERRA ZULU? January 6th, 2010 @ 6:37 AM Diplomacy,Military Superiority,Solidarity of the Peoples,Technology arise! 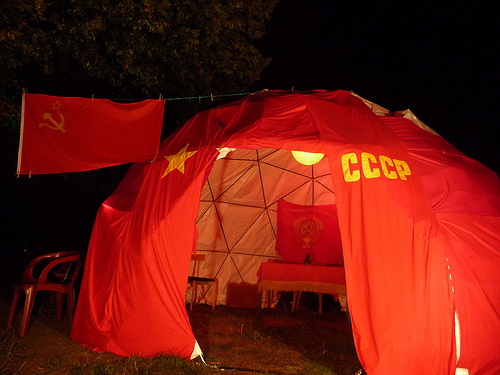 Finally, friends of Soviet Unterzoegersdorf, there is a video version of Ambassador Nikita Perostek Chrusov’s uplifting talk about youth culture, communism and overthrowing “the system” at ToorCamp 2009! Embed! Embed! Embed! Yes, it is true. Our wonderful Intelligence Corps provided us with exciting new information! We are able to reveal Austrian Air Traffic Frequencies! This is a glorious triumph of our wonderful nation! Please read our German language press release! Soviet Unterzoegersdorf Embassy @ HAR2009: Erected! A great success of solidarity! 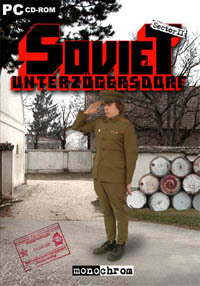 Soviet Unterzoegersdorf’s ebassy at HAR2009 is finished. The confederation is proud and wants to thank its international supporters! August 12th, 2009 @ 2:55 AM Diplomacy,Technology arise! International technology & security conference. Four days of technology, ideological debates and hands-on tinkering. 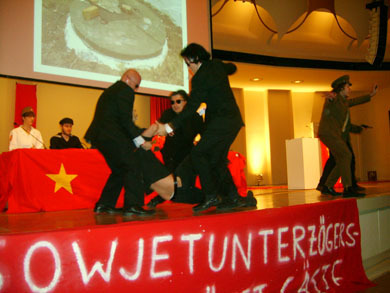 And we will not deny any rumors about a Soviet Unterzoegersdorf military intervention. August 13-16, 2009; Vierhouten, NL. July 4th, 2009 @ 5:43 AM Diplomacy,Technology arise! Let the proletarians sing with joy! Let us celebrate a glorious triumph! Soviet Unterzoegersdorf’s ambassador Nikita Perostek Chrusov will be giving a speech at a former ICBM silo in Washington State! On the 4th of July! Surrounded by volcanic dust and libertarian nerds! The irony! Glorious technology! Ambassador Nikita Perostek Chrusov will be giving a live speech — May 8, 2009! Through the vastness of time and space! Please pay him a virtual visit! 2100 hours Soviet Unterzoegersdorf Standard Time (9 PM Vienna Time). Soviet Unterzoegersdorf (pronounced “oon-taa-tsee-gars-doorf”) is the last existing client republic of the USSR. The soviet enclave maintains no diplomatic relationship with the surrounding so-called “Republic of Austria” or with the capitalist fortress “European Union”. 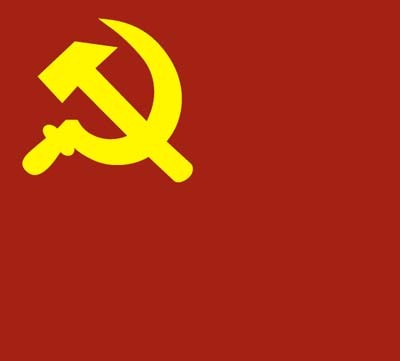 The downfall of the people’s motherland — the Soviet Union — in the early 1990s had a devastating effect on the country’s intra-economic situation. External reactionary forces threatened the last remaining proletarian paradise. Party secretary Wladislav Gomulka has been kidnapped and is being held in US-Oberzoegersdorf. We must save comrade Gomulka! Because communism isn’t an opinion. It’s a promise. Special Non Player Guest Characters: Jello Biafra, Bruce Sterling, Cory Doctorow, Emmanuel Goldstein, Mitch Altman, Bre Pettis, David ‘DaddyD’ Dempsey, Kyle Machulis, MC Frontalot, Eddie Codel, Irina Slutsky, Christian ‘plomlompom’ Heller, Jason Scott Sadofsky, Hans Bernhard, Robert Stachel (maschek) — and many more. Voice Acting by: Jevgeni Beliaikin, Sergey Teterin, Mikhail A. Crest, Daria Prawda, Bre Pettis — and many more. Soundtrack features: The Fat Man/George Alistair Sanger, Q-Burns Abstract Message, Zoe Keating, Neil Landstrumm, Jonathan Mann aka GameJew, Blockwerk, The Extra Action Marching Band, The Lazy, antivolk – Torsun feat. classless Kulla, Jan Klesse & Felix Knoke (left), Savant Trigger, Rioteer, MC Orgelmueller, Magic Jordan, Schaua, Horace, The Vladivostoks, Limpopo, Eric Skiff, Prometheus X, Kertal (feat. sunsetfactory), Bolschewistische Kurkapelle Schwarz-Rot, Farmers Market, Attention, Cosmonauts!, Woodn Earf, Trishes, Krach the Robot, Prosperity Denied, Arteom Denissov, Dan Oberbauer aka DJ Chronos, LFO DEMON — and more. Operating systems: Available for Windows, Linux and OSX! And many thanks to the fabulous comrades at CodeWeavers for Linux/OSX versions. And also bloshevik geetings to the folks at Silver Server for bandwidth sponsoring. For IBM PC and Non-Compatible! A true tour-de-red-force! Russian with English or German subtitles! Appealing graphical game interface! Creative Commons License! February 23rd, 2009 @ 7:35 AM Diplomacy,Military Superiority,Planned Economy issues,Protest note,Solidarity of the Peoples,Technology arise! An adventure marches on! Let the proletarians sing with joy! Let us celebrate a glorious triumph! Saturday, March 7, 2009. 8 PM. His Excellency Commissar Nikita Perostek Chrusov will be giving a speech and demonstration! Music! Dance! Dialectics! Finally — a recording of “Soviet Unterzoegersdorf: A Nation In Transit” is available for download. 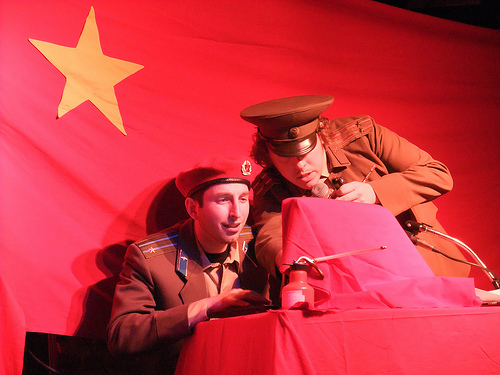 Enjoy our slightly glorious gala, presented at 25c3 in Berlin (December 28, 2008). Soviet Unterzoegersdorf: Sector II / Presentation! Comrades! 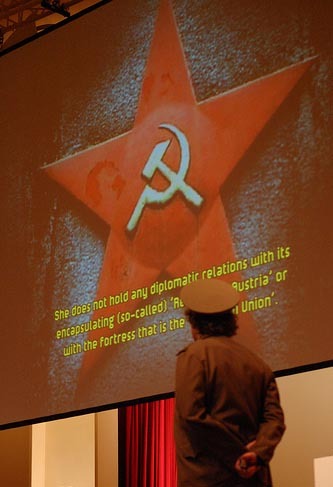 The presentation of Soviet Unterzoegersdorf: Sector II was a huge success! We only had to remove eight demonstrators, and only four of them need medical care. We chose sixteen heroes and heroines of betatesting and are glad being able to inform you that Soviet Unterzoegersdorf: Sector II will be available for download in the first week of January. A glorious (but short) reminder. Soviet Unterzoegersdorf: Sector II will be presented at the 25th Chaos Communication Congress in Berlin (December 28, 23:59, Hall 1). September 13th, 2008 @ 3:17 AM Diplomacy,Technology arise! Our wonderful number crunching device “Hyper-Hegel” is on display at the Paraflows 2008 exhibition in Vienna. September 11 – October 24 at Gefechtsturm Arenbergpark MAK-Gegenwartskunstdepot, Vienna. September 6th, 2008 @ 2:49 PM Diplomacy,Technology arise! Soviet Unterzoegersdorf’s hypertext expert and wine tavern commissioner Gennadyi Moloshnikov will host a diplomatic special interest gala of the Soviet Unterzoegersdorf Ministry of Foreign Difficulties. Comrade Moloshnikov understands the immense transformative power of technology and innovation (e.g. “modems”) and how they can improve the lives of all citizens. The Future Of Emergence: With Gennadyi Moloshnikov and the Soviet Unterzoegersdorf Jazz Dance Combinat. September 29, 2008; 10 PM. As part of the “Future of Internet” conference (MQ, Vienna).